The Jacksonville Jaguars’ (The Jaguars) sixth consecutive game at Wembley Stadium was attended by a record-breaking crowd of 85,850 fans. Today, the team announces a new and exciting partnership with Western Union Business Solutions (Western Union), a leader in global cross-border, cross-currency money movement, to become the Official Foreign Exchange Partner for the Jacksonville Jaguars. 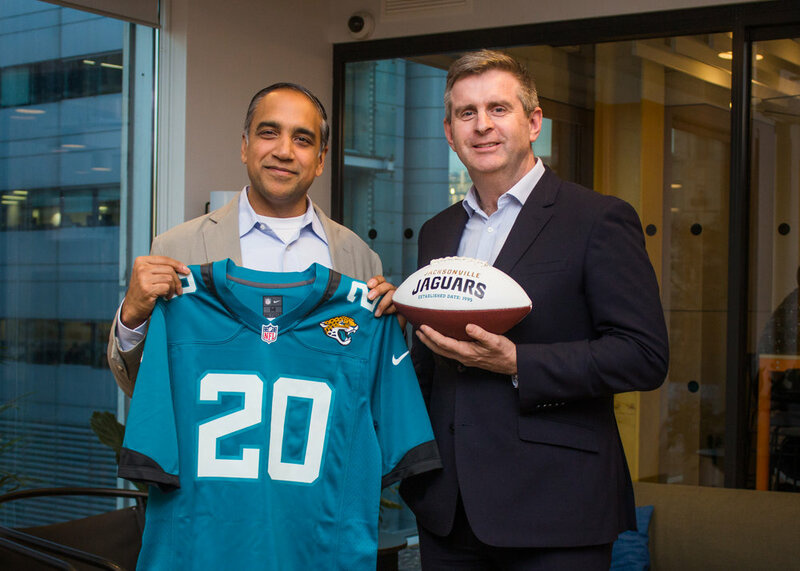 As the only NFL team dedicated to the UK market, the new partnership will help strengthen the Jaguars global position as Western Union assists in the management of foreign exchange business relating to international activity for the Franchise. The new partnership will also offer Western Union premium hospitality experiences at Jacksonville Jaguars games, including special events and memberships for the Jaguars exclusive Jags Black Business Community. Furthermore, the partnership offers the opportunity for Western Union to unlock new business avenues with other key partners within the Jaguars’ portfolio. As an existing partner to Fulham FC, the new venture with Jaguars UK will solidify the cross-border, cross-currency money movement leader as the only brand working across both Shad Khan’s sports properties in the UK.